On Mondays we’ll be going through the Hail Mary, phrase by phrase. This prayer is rich beyond telling, a fount of theology and spirituality. The first words get us started. “Hail” is not a word that means much to us in English. That in itself is interesting. Sometimes in prayer we use fancy language: to remind ourselves that prayer is a dignified thing; to find ourselves in a tradition; to challenge ourselves; to make ourselves think more deeply. And, too, sometimes we don’t have the perfect word in our stripped-down modern language. I often tell my students: the King James Bible, and the RSV, which is based on it, is not just in antiquated English (though it is that too). It is also a more literal translation than most modern ones. It finds a word to translate the original, instead of just dumbing things down. “Hail” is a greeting. It’s a remarkable way to start a prayer. It puts us on friendly terms with Our Lady. Ironic that a prayer that begins in such personal terms should so often be rattled off in the most impersonal way. More than our greeting, though, it recalls the greeting of the Angel Gabriel. For the first line of the prayer is just a quotation from Luke’s Gospel. The next line of the prayer, of course, is also from Luke’s Gospel. And then the second half of the prayer is the Church’s response. First, our two favorite titles: “Holy Mary” (or, “Mary, the holy one”) and “Mother of God,” and then our very simple request: “pray for us” (who are sinners, both now, and at the hour of our death). In effect, the whole Hail Mary is just a very simple liturgy: two short Scripture readings, followed by the simplest prayer, couched in the language of the Church. We can pray the Hail Mary like a little liturgy. The “Hail” should remind us of that the Gospel is Good News. Where Mary is, there is reason to rejoice, because God is there. 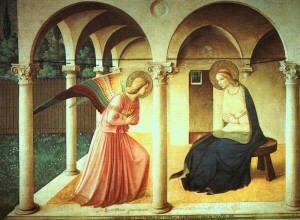 It is pleasant to reflect on this “Hail,” not only at the Annunciation, but at every point in life. We are trained to do this through the rosary. At the Finding in the Temple, Jesus is lost, causing sorrow for his parents; he scolds them for not knowing where he is; they don’t understand – and we say, “Be joyful, Mary!” And she is. Our Lady of joy carries the word of God in her heart, and it always brings joy. Why? Because we love the names of Jesus and Mary. The name of the beloved calls the beloved to mind. The Christian savors those holy names. We are not in such a hurry that we would skip over the most beautiful name of Mary!